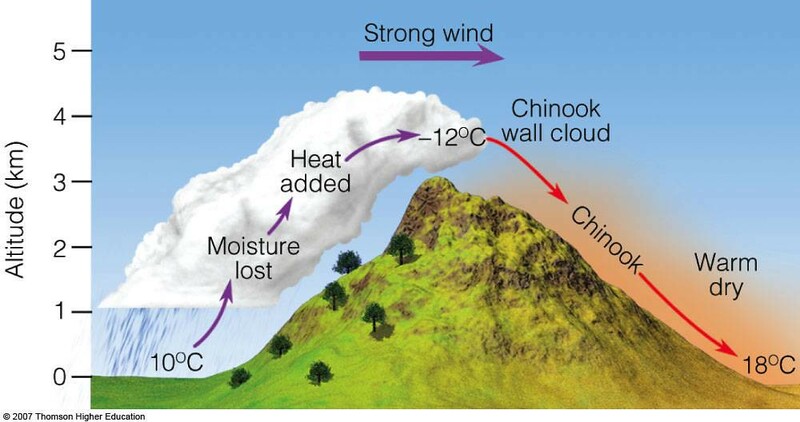 Chinook winds are just another incredible weather phenomenon many of us are familiar with living along the Front Range. Monday’s event was one of the more remarkable ones you’ll see as “snow-eating” winds kicked in and took our temperatures for a ride. 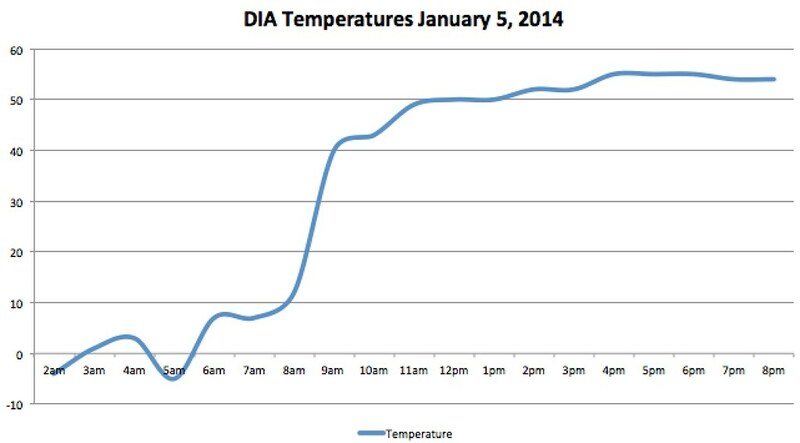 Our low temperature for January 5th came between 3 and 4am when Denver International Airport bottomed out at -5 degrees F. At 8am the downsloping winds kicked in and the temperature jumped from 12 degrees to 40 degrees in less than an hour. As of 8pm temperatures remained in the mid 50s, warmer even than the 3pm reading at DIA. From our low of -5 to our high of 55, Denver saw a 60 degree temperature swing in just 10 hours! To most, the term Chinook means “snow-eater” as this is exactly what we witnessed up and down the Front Range on Monday. The term actually originates from from the Native American tribe where the term originated in the northwest. As strong winds out of the west descend off the mountains the air compresses and warms adiabatically. These rapid snow melt is caused both by the very warm temperatures, but also is evaporated by the dry wind. While Denver was spared the worst of the wind, this was not true for the mountain communities east of the Divide this afternoon. 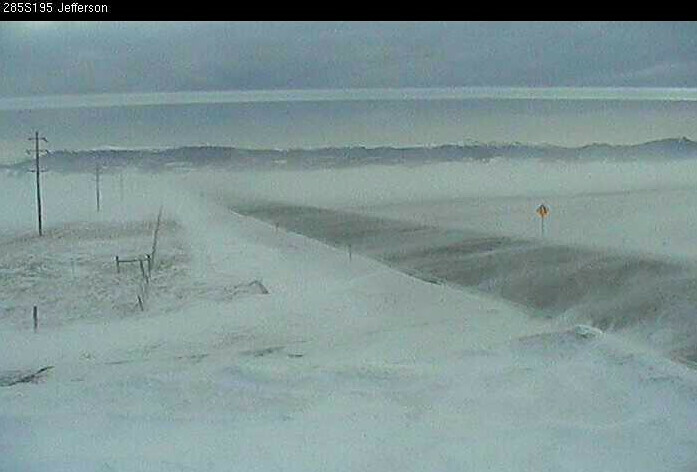 Portions of 285 were forced to close as whiteout conditions and gusts to 90mph made the roads impassable. The warm-up along the eastern Plains was fascinating to watch. At times Monday the difference of just a few miles meant the difference of 30 degrees or more. Slowly the cold air was forced out. Take a look at these incredible temperature variances at 12pm on Monday. 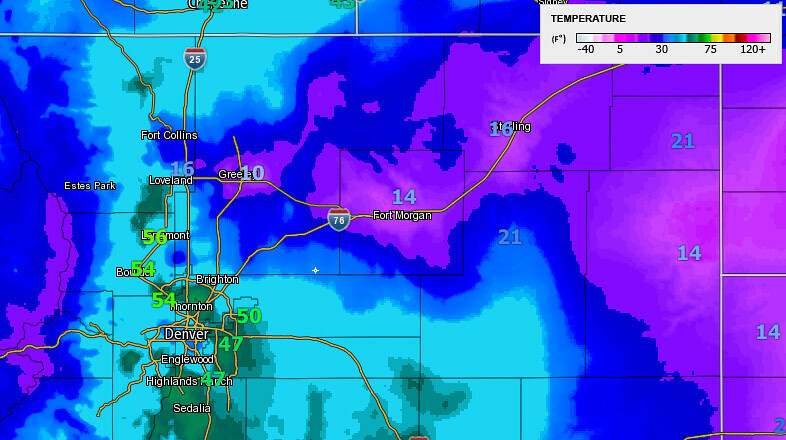 Most remarkably, the 56 degrees in Longmont, and just 10 degrees in Greeley. Because cold air is denser than warm air, the lower elevations, and those furthest away from the mountains were last to warm. We’ll be a bit cooler on Tuesday but still much warmer than recent days before another cold front approaches by afternoon. There will be a chance for snow across northeast Colorado as the front moves through Tuesday night and Wednesday, but snow totals should be light -- especially along the I-25 urban corridor, where totals will likely be less than an inch. We’ll keep an eye on things, and pass along any updates that are needed Tuesday. Wednesday will be much colder with highs back in the upper 20s and low 30s for Denver.